He shall Turn the Hearts of the Fathers to the Children. He Shall Turn the Hearts of the Fathers to the Children! God turned my heart towards my children. The second scene in the vision. I wasn't getting one picture of inheritance. “Colossal” is the word the Holy Spirit gave me to describe what God has done in some of my descendants' lives! I had been searching for the right word since the Holy Spirit gave me the following scene. This scene suddenly gave me understanding as I had been struggling with some “things of the Spirit,” knowing the Lord was wanting me to see something different. This writing is about our descendants, our inheritance, and rewards from the Kingdom of God. 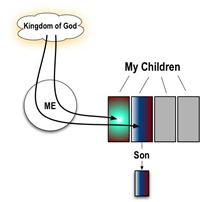 In this scene I had done something to have an inheritance from the Kingdom of God and I was giving it to my children. In other words, my inheritance from heaven was coming down through me to them, as pictured. It was happening because of me, not because of them or anyone else. This same thing can happen for you! In the scene I was looking at four rectangular picture frames as tall as I was in the scene. I could have walked into them. The two on the left contained a live motion picture of the lives of two of my children. The two on the right were just gray, as depicted having to do with my other two children. The left picture was of my first-born and my inheritance had (years back) already come through me to her, although I did not understand this until the Holy Spirit gave me this scene. In this scene I was in the process of giving another daughter the information about the inheritance from heaven that had also come through me to her. Maybe a better way to put it is that she was receiving an inheritance because of me. It was like it is in progress and looking at the physical this would make sense. At the end of the scene I was handing her a red, three-ring notebook, the one that represents God’s Heart. I was there at the moving picture and was handing it to her in the picture. I have never sought or been concerned about rewards as some people have. I have just tried to obey the Lord. My first encounter with the Lord about rewards shocked me! This was after spending three and a half years making the movies, often filled with 14 and 16 hour days, because the Lord had revealed I was behind His schedule. I knew a man who was retired, had an RV, and spent a lot of time seeing his children and traveling. I hadn’t seen much of my children over the years so one day I asked the Lord if He would provide more time for me to see them. I wasn’t wanting to spend as much time as this man, I knew better. I was just asking for more time than I had in the past. Anyway, I asked the Lord and He answered in a disgusted voice, “He has his reward!” I was stunned, thinking I had never sought rewards, so why did the Lord bring them up? I knew the Lord was saying that this man and his children should really enjoy their time together because that is all the reward they will have. I know now that the Lord was, even back then, preparing me for what He is presenting in this article. Having all the information for this article is exciting because we will be able to see what God is talking about with the phrase to turn the hearts of the fathers to the children. It goes far beyond the minds or ideas of man. In Colossians 3: 23 - 25, we see why the Holy Spirit was telling me over and over, “Rewards, rewards,” when I went to write about this scene. Our inheritance is a reward. This scripture also reveals that a person must serve the Lord correctly, that just being a Christian doesn’t do it because - there is no respect of persons. And whatsoever ye do, do it heartily, as to the Lord, and not unto men; Knowing that of the Lord ye shall receive the reward of the inheritance: for ye serve the Lord Christ. But he that doeth wrong shall receive for the wrong which he hath done: and there is no respect of persons. Here are a couple of scriptures referring to rewards. Here I need to talk about the two gray images in the scene. These represent two of my children who have not received an inheritance from the Lord. This is important to note and I know the Holy Spirit did everything the way He has so we would know there is a difference between inheritances/rewards and protections or having angels save us in serious situations and the like. I have had people tell me they have had protections in their lives, as well as miracles or angels doing things to save them. I have too; but here God is making a clear distinction between miracles we normally think of and rewards/inheritances from the Kingdom of God. He wants us to understand that there is a difference. One night my son, represented by one of the grayed pictures had an accident and rolled his pickup. There was more than one miracle in all the things that happened and the farmer who was there at the scene made sure I knew the Lord had been involved. We knew it and my son knew it, whether by angels or other means we don’t know. My son emerged from the wreck without a scratch. This was not true of the two other rollovers that occurred that same night. There was loss of life. Looking at the scene, knowing one of the gray pictures represents my son, we see that the Holy Spirit has revealed clearly that my son emerging without a scratch in this incident had nothing to do with inheritance/rewards from the Lord. I had always thought about protections when these things were occurring in my life or my descendants' lives but the Lord is making some distinctions. I am not here to discern the fine lines among miracles, protections, and inheritance/rewards. I’m not sure we should try but we need to see that rewards/inheritances are very important to our descendants as well as us. God has put me through things so we would know there is a difference. He has had me involved in certain ways so I would know He was in what was going on. In both of these inheritance/reward situations, represented by the movies of the lives of two of my children in the scene, I had to be obedient. A. I walked into my living room to have severe travail bring me to my knees. (God was bringing something to pass that needed to come to pass. See Extremes ) I had no idea why this was happening, but I allowed it to continue, knowing it must be important. B. The next day after work my daughter left with three other employees in a Jeep with a canvas top. It was one of the first nice days of spring. They went joy riding, with my daughter being in the back part of the canvas-covered Jeep, along with another person. It turned out that the driver had a hobby of driving railroad tracks; and he decided to drive some tracks with the Jeep. They were in the country and entered onto main line tracks. Ahead of them was a curve in the tracks, about a quarter mile away, and you could not see past it. Trains run about 60 mile an hour here and suddenly, in front of them, appeared a train coming straight at them. Reversing the Jeep, it fell off the tracks. The door was missing off the driver’s side, because it was being repaired. The driver bailed out the left side. My daughter unzipped the hidden zipper for the back window and bailed out the back, running down the embankment to turn and see the train hit the Jeep. Two were instantly killed. C. In talking with my daughter, she said she was in the worst place to be in the Jeep. She had not known about the hidden zipper until the day before when she helped an employee wash the Jeep. She found the hidden zipper when she was washing it and had joked when they left work in the Jeep saying, “Here’s the zipper if anyone needs out.” I quizzed her concerning the time of day it was when she helped wash the Jeep and found the hidden zipper. It was during the time I was in hard travail on the floor the day before. I knew the Lord had intervened in what the enemy had planned. She was in the worst place for escaping, but emerged without a scratch. More than once God has told us here at Take His Heart that what we do is directly related to what happens to our children. He was wanting us to understand what this article is all about. I must say that this picture is more important than I ever thought it could be. It’s about choosing life or death for our descendants. God does honor His Word and His idea of family is far beyond our idea! In Joshua, chapters six and seven, there is a wonderful picture of the blessings of obedience and also a picture of disobedience. Achan disobeyed God, took spoils and buried them under his tent. His disobedience resulted in the death of his children. And Joshua, and all Israel with him, took Achan the son of Zerah, and the silver, and the garment, and the wedge of gold, and his sons, and his daughters, and his oxen, and his asses, and his sheep, and his tent, and all that he had: and they brought them unto the valley of Achor. 25 And Joshua said, Why hast thou troubled us? the Lord shall trouble thee this day. And all Israel stoned him with stones, and burned them with fire, after they had stoned them with stones. Learning what God taught me about covenant, and His presenting these two pictures to me in scripture, my heart turned towards my children. I knew that if I obeyed God in all that He was teaching me that my children would receive blessings somehow. I didn’t know how but I believed it! But more real than this was the knowledge that my disobedience would allow bad things into their lives. Remember, the Holy Spirit told me, “The Lord your God is not a critical God but a God of absolute truth.” With that fresh in mind, look at this again: “What you do is directly related to what happens to your children!” Knowing these two things, my heart was turned towards my children! This has played a role in my life to stay the narrow course with God, as reported in the Boot Camp article. So in my thought processes there is a picture of, “I’m not only doing this for the Lord but also for my children.” When I focus on paying attention to the three spots, making sure I’m not consciously missing things, I’m doing it for my children as well as the Lord. To understand my youngest daughter receiving some inheritance read Law of Retribution. The story about the young man who rides horses is my daughter’s son, pertaining to the second movie in the picture to the right. I will place a link at the end of this article so you can finish reading here first. In the article I mention that the Holy Spirit told me the enemy was taking my grandson out. Was that over time or pretty quick? I don’t know, but taking this literally, we see that I actually have four descendants alive today because of inheritance/rewards from heaven. Can you think of a better reward? I am a truly blessed man! All through the Bible it is revealed that curses and blessings go down through generations. One way to stop curses from going down in families is for one person to really start obeying the Lord, obeying His voice. He is true to His promises and well able to perform. Abraham received an inheritance/reward because he obeyed. Cornelius received a reward for working righteousness. God moved heaven and earth to get him saved. Noah certainly received an inheritance/reward for obeying God. You know there are many more. The major element in all of this is to obey the Lord’s voice that comes down the River of Life to us individually and through the corporate body. (It should be noted that serving the Lord is not the same as serving a church.) It takes a meekness, a true humbleness, to truly follow after the “things of the Spirit.” This, along with righteous acts, is a part of what brings forth the Lord covering us in the day of His anger in the earth. We must run the race exactly as the Lord instructs. Noah did and Moses did, except for once which had a bad result. The temple of God was meticulously put together, as instructed by God. Christians, being the temples of the Lord on earth, need to realize that there are specific patterns to how the Spotless Bride functions. There is a reward/inheritance, for her meticulous obedience! She asked about ‘splice’ & saw, “listen” & “pay attention.” If you go at it (with an attitude of concern) like ‘where is it?...,’ you won’t find it. Listen & pay attention & it’ll become obvious. I knew I was going to have to be aware of something in the physical, paying attention. I knew that I was to complete something and that I needed to bring some things together (splice). I figured I had to just go on with what I was doing because I was not to have an attitude of concern. I was shown a single square picture that I wasn’t getting a hold of. It was a picture of inheritance.... I was then looking at the son of a man who attends a denominational (fundamentalist) church. I was told, "He has no inheritance!" Upon reading the notes, I paused, remembered the picture, thinking it looked like the face of a rock, and asked what it was that I was missing and began listening. The Lord said, "You can't have an inheritance without a marriage!" Immediately I was thinking about us as Christians marrying Him, by coming into covenant with Him! The first step towards marriage was to get rid of the three spots revealed by the Holy Spirit. I was then weakened for a split second as I realized that the great things the Lord has done (through inheritance) for my descendants would not have manifested if I had not stayed focused (paid attention trying to make no errors) on keeping the three spots out of my life. Glory, God is a God of His Word - that being what He meant when He said what He has said to us! I told the group here what had happened and some things I thought I had to write to complete this article. For one thing, I thought I was to expound, explaining covenant, and then give examples. This morning the Holy Spirit showed me that I was not to do that but that I was to simply write some of what I had thought about after the Lord said, "You can't have an inheritance without a marriage!" This I have already done. A wonderful thing brought to light by the Holy Spirit is that rewards/inheritances can come in the now, as well as in the hereafter. Another thing revealed is that these rewards/inheritances are determined by the Lord. How they come is determined by the Lord. The Holy Spirit has given evidence of this! The Lord told us, “What you do is directly related to what happens to your children.” This statement turned out to be much, much, bigger than I ever thought it could be. The word "directly" is certainly illuminated! During this time God revealed to me that inheritances go down, not up. Has He turned your heart towards your descendants, your children’s children?